I'm gonna get right to the point...I love this album! It so very drenched in feeling and humanity that it is quite an intoxicating musical experience. While Ry Cooder is the most recognizable headliner in this production (as well as being the producer), dont let this fool you. 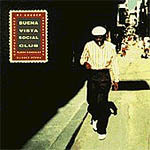 The fact is, it is he whos lending the supporting role to this marvelous group of seasoned Cuban musicians. After all, it is this music - their music - that runs through their veins. But having said that, I have to admire Ry Cooder for allowing the humbleness of this very rich and traditional music to shine through without the typical cold, sterile & over-produced sound that plagues most modern productions. The particular LP reissue at hand was released in November of 98 on 180grams of sumptuous vinyl by non other than Classic Records (from the RCA Shaded Dog back catalogue fame). These Grammy Award wining sessions were originally recorded in Havana, Cuba, in 1996 and subsequently released commercially on CD in 1997 by World Circuit/Nonesuch label. Ill say this, this luxuriously packaged two-record set will undoubtedly disarm all of your senses and leave you in a state of utter happiness. Happy to be alive. This music is that powerful. The fourteen tracks contained in this album vary amidst several traditional styles of Cuban music. From the son, to danzón, to bolero...but even some American jazz derivatives. All the compositions are exemplary with some of my favorite songs being: Chan Chan, Pueblo Nuevo, El Carretero, Amor de la Loca Juventud, amongst many, many others. To better illustrate my point (and at the risk of being somewhat embarrassed to admit), I must tell you that while listening to Pueblo Nuevo I was almost moved to tears. Thats how powerful this music is! This composition by 79 year old pianist Rubén González is a masterpiece. By the time Manuel Guajiro Mirabal enters into his trumpet solo midway through the song -- and after Gonzalezs virtuoso piano solo -- every hair on my body stood right up! This is no joke! And while his trumpet solo is going on, Rubén González gets into this amazing groove thats really saucy, followed by a very understated but great bass solo by Orlando cachaito López. Great, great stuff! I owned this CD for a full year before this LP release and had no idea that it could be this much better! You read this? MUCH BETTER, I SAID!!! Sorry I didnt mean to scream but its just that Im way too excited about this re-issue. Classic Records have outdone themselves once again with this fantastic release. WOW! What sense of ambience, detail and most importantly tonal richness thats soooo lacking in the shiny silvery disc! Theres no contest. Gonzálezs piano is now large, open and it breathes. All the vocals and instruments possess an organic, warm, natural feel which better conveys the sense of the musicians playing right in front of you. With the CD, this recording sounds just ok...but with this analogue LP, the sound is pure heaven! While this might not be the perfect recording in absolute terms, Im now thoroughly convinced that after this Classic treatment...its like WHO CARES! Its better than audiophile quality...its one with the music!